We just spent four days at the most magical island, San Pedro. We had been lusting after it as soon as we learned it was where the local dive shops go for day trips. They call it “seal island”. When Brian’s mom, Sue and her husband, Tim came to visit us we all headed to San Pedro for a few days. It was a wavy 15 mile passage to San Pedro. Magic was beating into the waves and rocking a bit. I went down below and took a nap, bored with the wavy passage. Brian woke me up as he called down to me to come take a look, we are at the island! I stepped out on the deck and saw soaring white cliffs next to us with a few scattered nests and large sea birds. Fat, brown sea lions lounged on tan rocks at the shoreline. Soon we pulled up in front of a small, rocky beach with a line of several dozen sea lions next to the water, barking wildly. 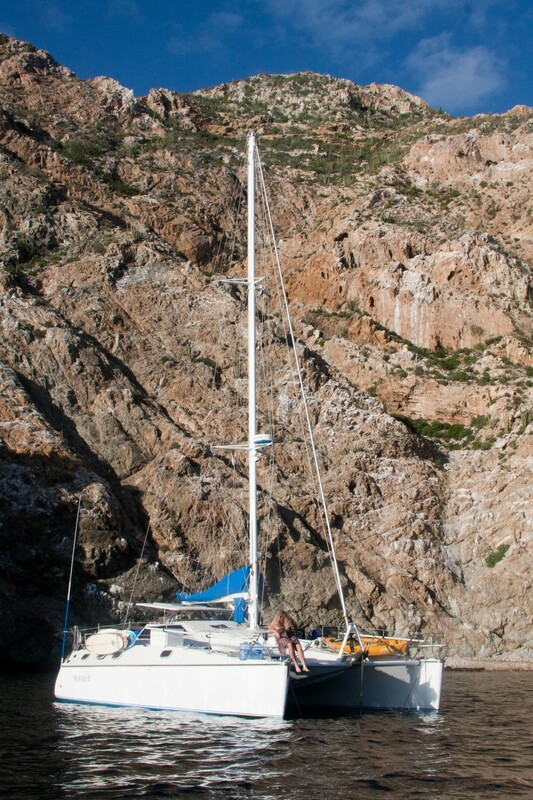 Brian dropped the anchor close to the rocky cliffs. I was a little concerned, especially since one of our engines had stopped working that morning. If winds started blowing us toward the cliff we would only have one engine to try to keep us from hitting the rocks. We really liked this spot, though, and we all wanted to find a way to make it work. Brian put on his scuba gear and dove to the bottom to wrap the anchor chain around a boulder and secure the anchor itself against a large rock. Meanwhile, Tim went to work on the engine and found a way to hotwire it in case we needed the power of a second engine to get away from the cliffs. With confidence in our anchor placement, we began to enjoy the amazing setting. Animals were everywhere. A couple sea lions came out to the boat to greet us, looking up at us curiously. The other sea lions flopped around on the beach, barking away and occasionally rearing up to bite each others fleshy necks. Everyone wanted to go scuba diving, but I looked at all the sea lions near us on the beach and didn’t like the idea of diving right next to their beach. I told everyone else to go ahead and I stayed behind on Magic. 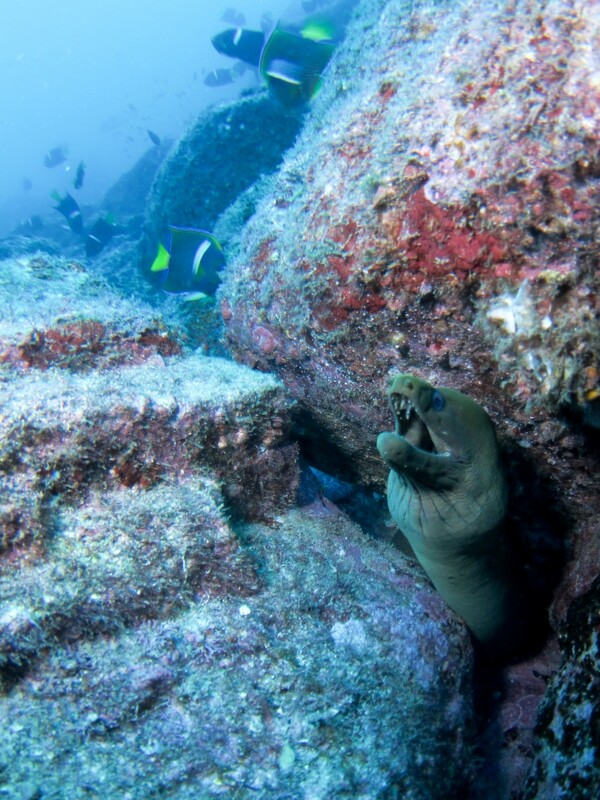 This island was barely even mentioned in our detailed Sea of Cortez cruising guide and is probably more of a place for scuba day trips than for cruising boats to anchor overnight. Brian, Tim and Sue entered the water in their scuba gear. They swam a short distance toward the cliffs and descended. Within minutes they were back on the surface and swimming quickly back to the boat. “The sea lions are aggressive”, Brian called out to me. Everyone made it back to the boat safely with tales of first being nipped and mouthed by one medium sized sea lion, and then two more medium sized sea lions quickly came. They left Brian alone, but they mouthed Tim’s head, nipped at Sue’s neoprene hood, and one opened its mouth wide and wrapped it around Sue’s scuba tank. The decision was quickly made to abort the dive. Sue, a retired veterinarian, said that often mouthing is a prelude to biting. Last time we snorkeled with the sea lions at Isla Los Islotes near La Paz, the juveniles nibbled on my scuba fins. This is not considered aggressive; it is just a playful, typical sea lion pup behavior. But these sea lions at San Pedro were not pups and they were mouthing the heads and backs of the divers, not the fins. Brian, Tim and Sue got in the dinghy and went to a different part of the island, far away from the large group of sea lions on the beach. 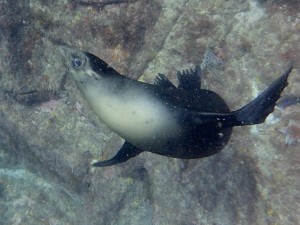 They had a great dive with excellent visibility and the sea lions they saw were not aggressive. The next day I felt a little nervous about diving but decided to do it anyway. I hoped if we went back to the same location of the second dive yesterday the animals would again act friendly. I could understand the sea lions may be more aggressive when defending their beach and was trying to give them the benefit of the doubt. As we got ready to descend, a dive boat from San Carlos showed up full of divers! I felt relieved. If the dive boats visit this site then surely the sea lions are used to seeing divers here. The dive was wonderful. Visibility was about 60 feet and the sun was shining on colorful coral, eels and fish. I saw a few sea lions in the distance and kept a close eye on them. None of them were even slightly aggressive and I felt more at ease with them by the end of the dive. Later that day we enjoyed another great dive with good visibility. The next day I went diving with Brian and Tim at the same site. Visibility had decreased dramatically and was only about 30 feet now. It was late afternoon and we were diving in the shade, making the water appear especially dark. About 15 minutes into the dive I found myself feeling increasingly uneasy. Large sea lions appeared suddenly out of the darkness and swooped quickly through the water nearby. I did not like that one bit. 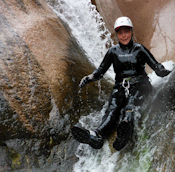 After a few minutes of feeling uneasy, I was not enjoying the dive anymore and did not want to continue. I wrote this on my tablet and showed it to Brian and Tim: “I don’t like this. It’s dark and vis is poor.” I gave the hand signal to turn around and we swam back to the anchor. We began our ascent and stopped at 15 feet depth for a 4 minute safety stop. During this safety stop a medium sized sea lion charged us repeatedly. Once it even came at us with its mouth open wide, showing yellow, jagged teeth, then swooped away at the last second. I huddled against Brian with my limbs tucked in, not moving. Tim fended off the charging sea lion with his large dive light, being careful to never turn his back on the animal. We completed this uncomfortable safety stop and then ascended 15 feet to the surface. 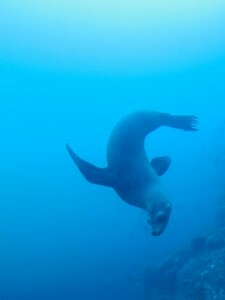 This was not my favorite dive but it was a valuable opportunity to learn how to manage discomfort underwater, stay calm, and remember the importance of the safety stop when I really would have just preferred to surface and get away from that charging sea lion. Brian and I went out sea kayaking afterward and had a really great time watching the sea birds and paddling in and out of the many small caves cut into the rocky cliffs of the island. One very dark sea cave was home to a huge sea lion perched on a rock inside. As we entered, his distressed barking echoed loudly in the small space. Soon he slipped into the water and we had the cave to ourselves. After the way they had harassed us, we felt somewhat justified invading the sea lions special cave and ignoring his loud protests. We quickly moved on after shooting a few photos and soon reached the southern tip of the island. 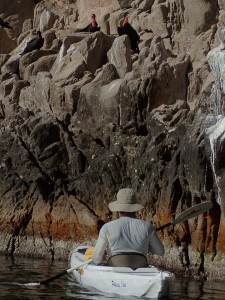 Small groups of Frigate Birds and Boobies sat on rocks only 10 feet above us, and as long as we remained quiet they showed no signs of distress at our close proximity. There are probably very few people visiting them in sea kayaks and they didn’t seem to mind. We spent awhile near them just enjoying their earthy, pungent scent and watching the male Frigate Bird’s bright red, leathery neck pouches flapping gently as they breathed. 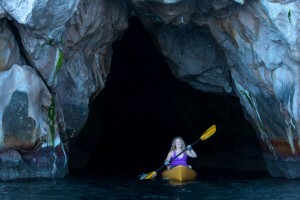 The kayaking was so enjoyable we got up early the next morning and paddled around the island again, this time exploring further in both directions and finding more sea caves. Several of the sea caves rumbled and sputtered as the swell moved in and out of cracks deep within, creating delightful sea monster sounds. 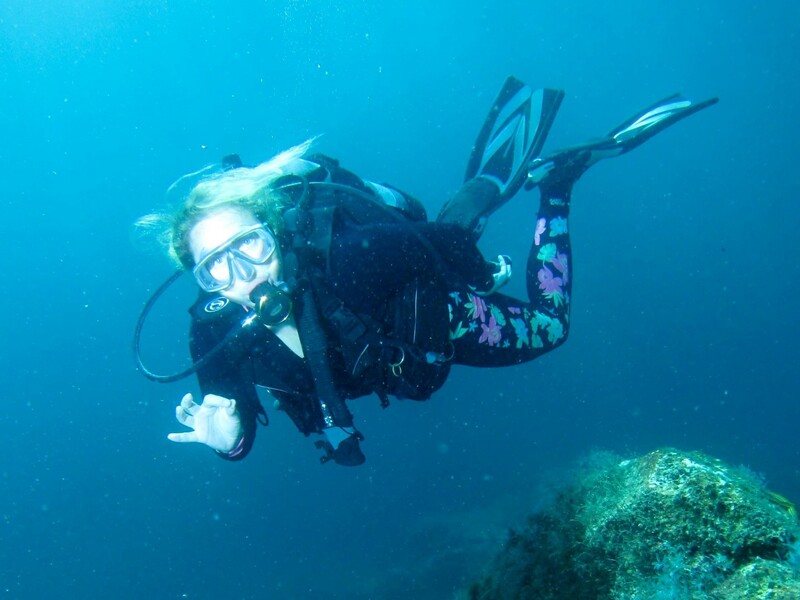 We went diving again on our last day at San Pedro. Once again visibility was poor, so we decided to stay at shallower depths so there would be more light and the sea lions would be easier to see. This worked well for me and I felt comfortable diving with them in these conditions. They were in a very playful mood and exhibited no aggressive behavior today. I relaxed and enjoyed their acrobatics. 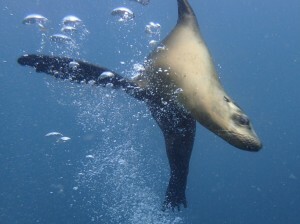 At least a dozen sea lions swirled around us and they seemed genuinely pleased to share their underwater world with us. When they are friendly there is nothing better than diving with them and seeing them up close! 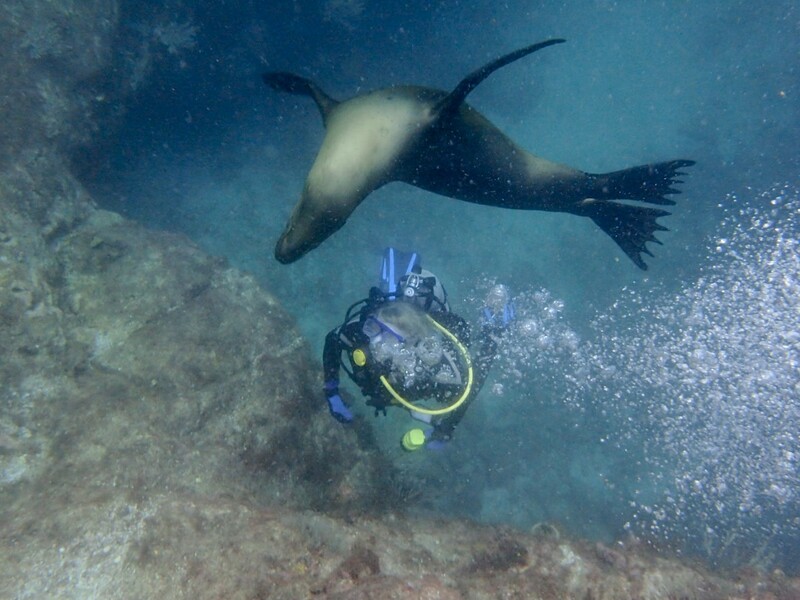 Sea lions are the only animals I have been underwater with who seem genuinely interested in interacting with divers and also the only animals who seem curious about the bubbles flowing out of scuba regulators. I’m glad my experiences diving with them ended on a high note and I have very fond memories of Isla San Pedro.